The SuperFly replaced the MSR SuperFly Ascent. Robust pot supports and a wide burner head bridge the gap between minimalist trail cooking and gourmet campsite cooking. 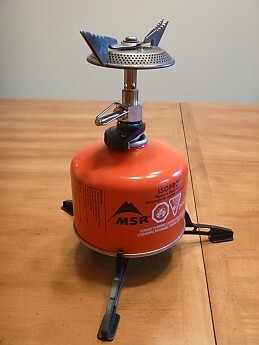 My go-to canister stove, even if I'm car camping. I actually prefer a stuff sack to a hard carrying case. It not only takes up less room in your cook kit or pack, but it's flexible and items can be tightly packed around it, if need be. Screw the plastic mount collar all the way down the threads. Slide the plastic collar over the canister valve. Tighten the stove down, holding the collar in place, until flush with the canister. Turn the pot supports 90 degrees to evenly support all four quadrants of the pot. Flip out the fuel adjustment toggle, and done. The pot supports are large and robust. I don't worry about a meal tipping over if it's cooking atop these. Stable as stable can be. 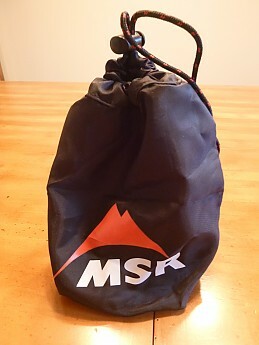 I don't know if MSR makes a more stable, upright canister, backpacking stove. Ignition's a cinch. I've never once had trouble lighting it, or keeping it lit - even with 40 to 50MPH winds that ripped grommets from my tarps! Although an "autostart" piezo igniter's a nice idea, I'm a firm believer in "The Less Moving Parts, The Better" school of thought, and a BIC (or even a match) works just fine. The burner head is large and better disperses the heat more widely than some of MSR's smaller models (PocketRocket, MicroRocket). This is a matter of preference and cooking needs, but I like that I can simmer meals on this stove. The large, wire valve control is conveniently large enough to use if operating the stove while wearing gloves (even if you've gorilla-sized mitts like I do). If you're in a hurry, it'll boil a liter of water in 3 minutes and change. If you're not, it'll do it anyhow! There are worse problems. It sips fuel, and frugally at that. I can't tell you how many meals I cooked on this thing after I was absolutely certain I was out of fuel. 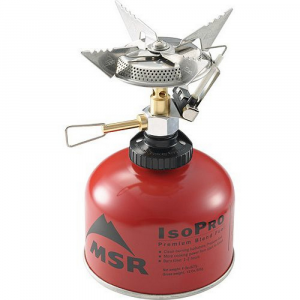 One stove and one eight-ounce canister of IsoPro will easily get a couple backpackers by for a weekend trip, especially if they're only boiling water for freeze-dried meals and morning coffee/cocoa. However, after cooking over a hot flame and after getting some miles put onto this stove, you'll find the pot supports will warp. Now, by "Warp," I mean the metal will expand and make the supports a little harder to turn. Keep the unit clean, and they'll move freely again with a little elbow grease. An adjustable center screw can also be loosened or tightened accordingly. 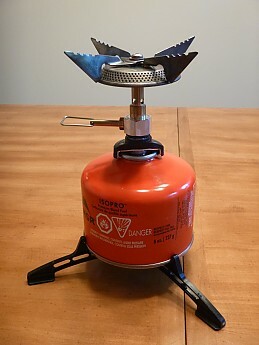 This stove probably ranks right next to my tent as far as favorite gear goes, and proved to me why the MSR name is as popular and long-lasting as it is. 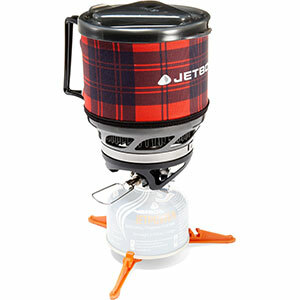 I actually own TWO of these SuperFly stoves, bringing the second along with me on car camping trips. I consider them a detachable two-burner stove. This allows my cooking partner and myself to divide the picnic table in half and give us each our own prep areas. Moreover, since we're operating on two separate fuel bottles, if one unit runs out of gas, we can still continue to cook on the other. I needed a new stove and was leaving on a trip that day so I picked this one up at REI. The stove worked great. Easy to setup and easy to carry. Solid choice for minimalists who want to do more than boil water. Broad compatibility with fuel canisters from vendors across the globe is a big plus. 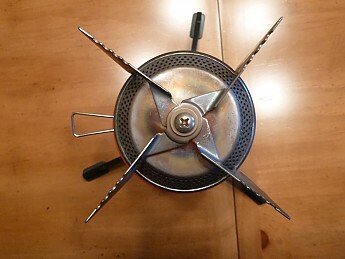 I imagine the MSR PocketRocket outsells the SuperFly by a large margin as it's lighter, smaller, and cheaper, but there's a place for this stove among campers who expect to do more than boil water. With its broad burner, the SuperFly spreads heat nicely, and can reliably scramble eggs, saute vegetables, brown hamburger etc. just as you might at home, with no worries of scorching food in the center of the pan. If you need to boil a pot of water, it can do that too and quickly. 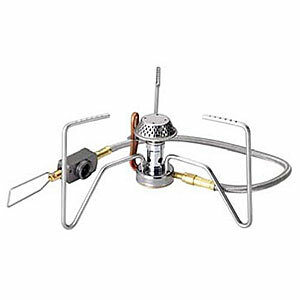 Setup is a little different with this stove as it has the ability to work with canisters from a variety of vendors. Once you get the hang of screwing the stove onto the canister, it will become second nature. And it's nice to know you can use it with just about any brand of canister, even Bleuet Camping Gaz in Europe. Flame control is very easy from simmer to roaring flame, with bare hand or glove. The pot supports serve as a windscreen, but not a great one. You'll want to improvise a windscreen anytime there's a breeze. Stability hasn't been an issue for us, though we never buy the narrow little Snow Peak canisters out of concern for stability. There is a three-footed stabilizer you can get if you want it. Packability is not its strong suit; it's rather awkwardly shaped when packed. Pack its stuff sack among things that will fill in around its odd contours. The construction is solid, and I don't foresee it doing anything other than its job for many may years to come. Most of the hype these days is on integrated stoves and cook kits, and none of that applies here. This is simply a stove. So the heat transfer efficiency that's been achieved in the setups with integrated wind screens and built-in heat-exchangers on the pots etc. doesn't apply. Blessing and a curse. This is lighter, though more heat is wasted so on a long trip so you'll have to carry more fuel. 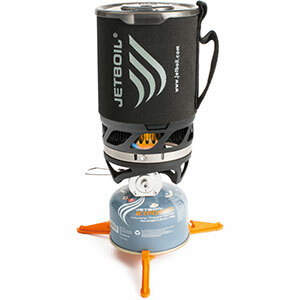 We're happy to have this stove, but when we got it, MSR Reactor / Jetboil systems weren't yet available. I have no plan to replace the Superfly, but if I were shopping now, I might seriously consider one of the newer systems — or not, depending on the ruggedness/simplicity/price of the product. Thanks for the review, D. I agree that simple is good. Thanks for sharing your SuperFly review, D williams. I always appreciate when people review their dependable gear that may not get as much attention as other models. Couple things not mentioned in any of the reviews of the Superfly - I have had mine for close to 10 years. 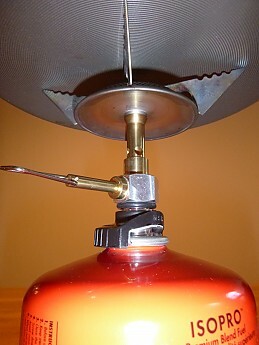 The canisters that can attach to the stove are the industry standard screw-on 4, 8, and 15 ounce plus the similar, but threadless Bleuet Camping Gaz canisters. 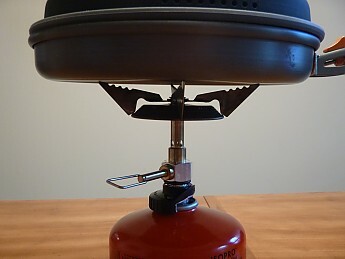 An important feature to me is that you can use the stove not only sitting on level ground or a table, but you can use the hanging stove accessory (but don't use the stove hanging inside your tent - fire hazard, oxygen depletion if you keep the tent tightly closed, and carbon monoxide build-up. Thanks for your comment! I don't have the hanging setup, so I didn't mention it. I imagine it would be necessary for sailing or big wall climbs, neither of which I do. 'Could also be handy in snow too if the fuel was warm enough to flow properly. And I wholeheartedly agree fire / carbon monoxide and tents DO NOT belong together. 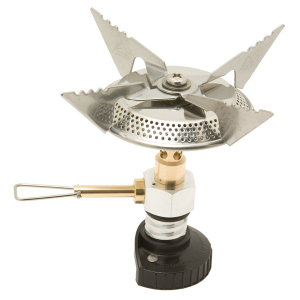 The Superfly is a simple stove that works well for moderate use. Cooking on it is better than the Pocket or Micro Rockets from MSR as the burner is wider than average so it provides a much better simmer. It takes a couple minutes to boil 1.5L of water. The same burner makes it harder to fit well into pots. Outside of that it is your average canister style stove. Fuel consumption is average, as is its weaknesses to the winds. Overall not a bad buy. Simple and cooks well. This is a great stove. I've found that this stove is easy to light and has great temp control. I was also surprised by how stable I found this stove while using an 8 oz fuel canister. My only gripe (and it's a minor gripe at that) is that the pot supports can be difficult to move, but again this is only a minor gripe. Good price and GREAT with fuel. I cooked about 7 large meals involving a few courses each and still had plenty of fuel left on one 250 canister. On hikes it's very light and pretty durable. Also, it is quick to boil. I agree with the others on this stove for the most part. One of my favorite features is it can adapt to just about any canister. I haven't found one it won't work with. I have also used it to an altitude of about 10,600 feet and it worked perfectly fine. 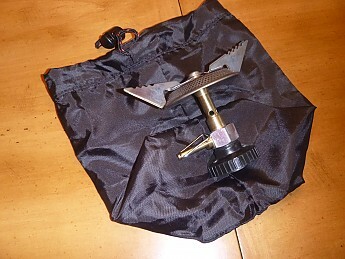 As far as winter camping goes (yes in the snow) I had no issues with it when I used the IsoPro fuel. Though I haven't used it below about 14 degrees farenheit. I have 4 years on this stove myself and it gets used a minimum of at least once a month. 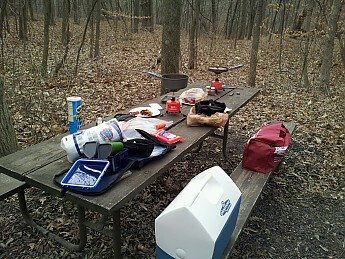 We were on an 8-day family trip for the 6 of us and our Coleman 2 burner propane went down on us the morning of day 3. 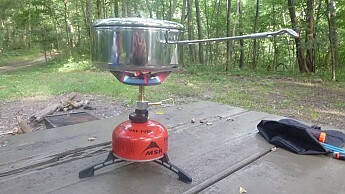 We used the SuperFly to boil water, cook breakfast the rest of the trip (and lots of foil meals over the fire). It is an excellent back up. One of the best parts is how sturdy the pot stand is. I have had issues with a few others. It is a winner. I have used this stove for about four years now and prefer it over my WhisperLite, mainly because of the attributes others talk about. It's fast, easy, requires no pumping and no pouring. It's frugal with fuel and exceptionally dependable. The age old drawback is that canister stoves are not good in the winter...so, the WhisperLite is a great backup. Very easy to set up, no pumping or clogging of fuel. Very easy to set up, no pumping or clogging of fuel. Fast boil time and the fuel canisters last longer than expected. Very easy to carry and light. A warm weather stove.